We are introducing Pecha kucha (pronounced pe-chak-cha) as a new session format for EdTech2010. Pecha kucha takes its name from the Japanese term for “chit-chat”. Pecha kucha presentations consist of exactly 20 slides, each of which is displayed for 20 seconds. Total presentation time is precisely 6 minutes 40 seconds. See www.pecha-kucha.org for more information. The pecha kucha presentation format enables the presenter to deliver a short, focused, quick-fire presentation on their topic. Please submit a 300 word abstract, making sure to demonstrate the benefits of your topic/research to teaching and learning. Posters offer another way to share information visually such as research findings or innovative applications. While posters should be self-explanatory, presenters will be expected to be available to discuss their work during short moderated sessions at specified times during the conference. We ask that you submit a 300 word abstract describing your poster. Abstract submissions to all tracks are now closed. Many thanks to those who have submitted abstracts. Final versions of accepted abstracts will be accepted up to 23 April 2010 (all abstracts and papers will be published online). All presentations (PDF or PowerPoint slides) and papers must be submitted by 14 May 2010 and will be made available via the ILTA website during the conference. The abstract date has now passed, so the submission system will not accept further abstracts at this time. Go to the directly to the EdTech2010 to verify your submission. If you require additional assistance, please see these useful printable instructions (pdf). 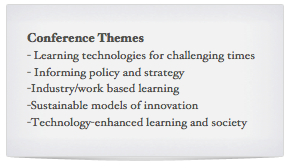 A selection of the best papers submitted to EdTech 2010 will be invited to submit to a dedicated ILTA AISHE-J online journal publication.